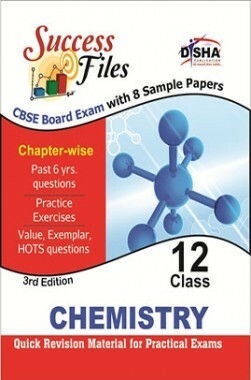 CBSE-Board Success Files Class 12 Chemistry is an apt product for students of class 12 to give an extra edge to their preparation. This is a thoroughly revised and updated 2nd edition of the book. The book will be an eye-opener for all class 12 students who will appear in the CBSE board examination. • The second section ‘Sample Papers’ provides 8 Sample Papers designed exactly on the latest pattern of CBSE Board (26 questions) including value based questions. These tests follow the CBSE blue prints and hence act as the perfect assessment/ revision material. Each Mock Test includes value based questions as asked in past CBSE papers. The tests will help the students in developing speed, writing to-the-point answers and completing the test within the time frame. • The third section "Quick Revision Material for Practicals" is very useful as the practical constitute 30% weight age. Along with the description of the practicals selective questions from the NCERT Lab Manuals have been explained for better understanding. • All in all it is a perfect book for every student appearing for the Board exams.